Famed poet and author Maya Angelou died this morning in North Carolina. She was 86. "She'd been very frail and had heart problems, but she was going strong, finishing a new book," Angelou's agent Helen Brann told ABC News. "I spoke to her yesterday. She was fine, as she always was. Her spirit was indomitable." Angelou recently canceled an appearance at the 2014 MLB Beacon Awards Luncheon, where she will be honored. Major League Baseball cited "health reasons" Friday in saying the 86-year-old won't make it to the May 30 event in Houston before the annual Civil Rights Game, the Associated Press reported last Friday. "Her family is extremely grateful that her ascension was not belabored by a loss of acuity or comprehension. She lived a life as a teacher, activist, artist and human being. She was a warrior for equality, tolerance and peace. The family is extremely appreciative of the time we had with her and we know that she is looking down upon us with love," Angelou's son Guy Johnson said in a statement. 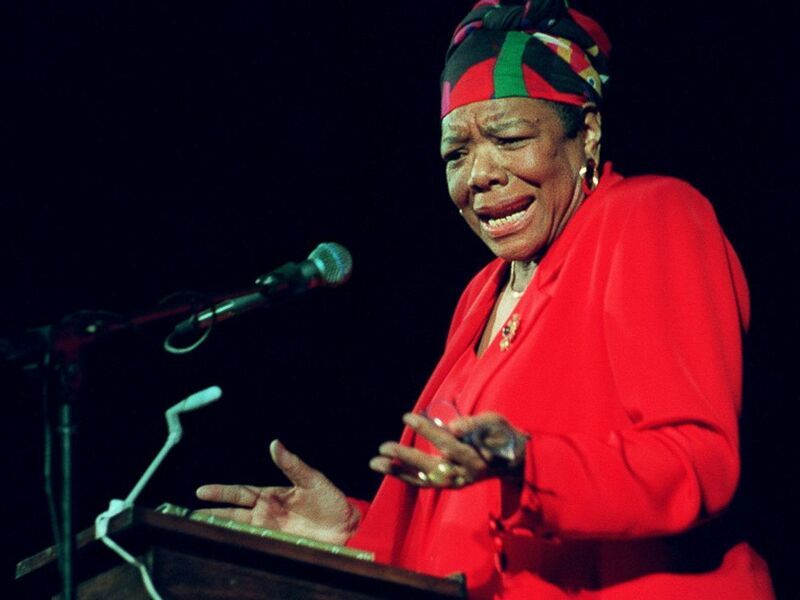 Dr. Maya Angelou delivers poetry to an audience of Tufts University students at the Somerville Theatre in this April 28, 1997 file photo. Born Marguerite Annie Johnson in St. Louis, Angelou worked a number of jobs before publishing her first book, "I Know Why the Caged Bird Sings," which focused on her own life, in 1969. Nominated for a National Book Award, the tome skyrocketed Angelou to national fame -- especially given the controversial nature of several sections, which dealt with child molestation, racism, and sexuality. "I thought that it was a mild book. There's no profanity," Angelou told AP. "It speaks about surviving, and it really doesn't make ogres of many people. I was shocked to find there were people who really wanted it banned, and I still believe people who are against the book have never read the book." After the success of her first book, Angelous wrote the screenplay and score for the 1972 film, "Georgia, Georgia," becoming the first African-American woman to author a screenplay that was filmed. It was nominated for the Pulitzer Prize. She would go on to write more than 30 published works, including five more memoirs and many books of poetry. Beloved by stars, Angelou was a mentor to Oprah Winfrey and favorite of many presidents. She spoke at the inauguration of President Bill Clinton and was awarded the Presidential Medal of the Arts in 2000. In 2011, President Barack Obama honored her with the Presidential Medal of Freedom. Last November, ABC News spoke with Angelou, who lived in in Winston-Salem because of her longtime teaching job at Wake Forest University. "I'm learning that I have patience and that patience is a great gift," she said. "I know that people only do what they know to do. Not what they say they know, not what they think they should know. ... People do only what they know how to do, so I have patience. I pray that people will have patience with themselves and learn more."